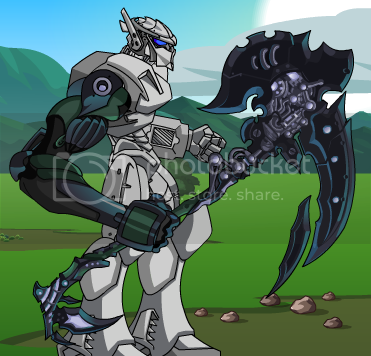 [b]Location:[/b] [link=<url of shop>]<Name of Shop>[/link] and/or "Default on [link=<url of mecha>]<Name of Mecha>[/link]"
For the Rx for Destruction Axe, wouldn't it be better as a clarification to say that it heals 15% of the total damage done OVER two turns rather than 15% for two turns? It makes it sound like it's healing 15% each turn. It [The Heal] can also activate regardless if the hit actually activates. Description: Reduces enemy boost and cuts their fuel lines for a DOT. You can use it afterward to deflect most attacks for a turn! Try it with the other Avenger weapons or on a Geekatron. Description: Nanobots will repair damage done to you, and autopilot functions will increase your bonus and defense. Try it with the other Avenger weapons or on a Geekatron. Description: The Food Bill will have you sweating metal and credits. Remind yourself never to eat here again. Design concept by EinhanderX01. Sellback: 450NG's before 24 Hours, 125NG's after. Description: This blade is modeled after a legendary weapon that was tempered in a dragon's fiery blade! Its sharp edge packs some real heat in battle, burning your foes and melting through them. Images: Imitation DragonConquest Blade, Attacking! Also, the Imitation DC Blade scales up to level 45, as told by Vivi. Description: Laser does extra damage and is extremely powerful when used against EbilCorp opponents! Hit 4: Increased chance for a critical hit and a chance for "Extra hit!! ", deals an additional hit of damage. I haven't done this in a while, so if I get anything wrong please correct me. Not sure about effects but it's what I've found from testing the weapon. [*]Pop-up: "Tryptophan Overload! Front Arm Disabled! ": 100% chance to disable opponent's Front Arm. [*]Chance for Pop-up: "Extra Tryptophan! -45 Bonus! ", 'Extra Tryptophan! ': -45 Bonus for 3 turns. [*]Chance for Pop-up: "Extra Tryptophan! -35 Boost! ", 'Extra Tryptophan! ': -35 Boost for 3 turns. For reference, link to shop: Clicky! Sorry, was out for the evening. I've made a few changes to the NSC Turkey Maces so use the code of the latest post. [*]Pop-up: "Tryptophan Overload! Front Arm Disabled! "/"Tryptophan Overload! Back Arm Disabled! ": 100% chance to disable one of the enemy's weapons. Order is FA/BA. [*]Pop-up: "Tryptophan Overload! <part> Disabled! ": 100% chance to disable one of the enemy's weapons. Order is FA/BS/FS. [*]100% chance for Pop-up: "Extra Tryptophan! -45 Bonus! ", 'Extra Tryptophan! ': -45 Bonus for 3 turns. "Waddled! You think you are a penguin! Attack Bonus and Damage lowered!" Nerfs Boost and Bonus by a random amount (between 20 and 50) for 3 turns, values are different for each stat. Can someone provide the attacking image of the massive slicer arms for House Wolfblade, purchased from the Gears Games shop? which implies any random value in between. Note: The usage order of this weapon carries over battles. For example, if the player uses the BackGun to nerf immo. resist but does not use it again in the same battle, the weapon will 'begin' with the stun in the next battle. These changes should be made to better facilitate understanding of the weapon. Description: A special gift for those who invest in the AE Sketchbook. Scales to level 100. Did some extensive research on RH weaponry. Numbers are verified through numerous tests. 100% for "Brick Assault! Enemy Bonus and Boost lowered!" -15 Boost and Bonus for 99 turns. Stacks with each use (2nd use -30 Boost and Bonus, 3rd use -45 Boost and Bonus). If your opponent is already at -45 Hit and Boost from this weapon's effect: "Your Enemy is already fully Bricked!" No effect. Description: Stepping on a block really, really, hurts! Now you can use that power against your enemies! "Extreme Blast! Disabled Head Weapon!" "Destructive Blast! Body Weapon Disabled!" Description: Blast away your enemy! This weapon's damage and BtH is increased per use. It will also lower your opponent's BtH! Special SC version will attempt to disable enemy Head AND Body weapons! Description: This weapon uses an advanced solar core for power. It's been perfected so it won't have damage or power spikes! Will cause EP DoT and nerf the Bonus to Hit of your Foe. Description: Bricks are awesome. Cannons are awesome. Put them together and you get something that's doubly awesome! Description: "Blast away your enemy! This weapon's damage and BtH is increased per use. It will also lower your opponent's BtH! Description: This weapon uses the power of a cookie to summon a wave of milk from the Cookieverse. Don't think too hard about it, just enjoy the weapon and its random effects. Done with this! ~golden All done! I'll get to the SC Cookiemancer and Solar Buster later. First, relaying some DNs by Ash for the Solar Buster series; it will be followed by the last few SC weapons. First 3 hits nerf enemy bonus by 20 each, capping at -60. Each hit must connect to nerf. Lasts for 3 turns. 4th hit applies a 2.5X EP DoT effect for 3 turns. First 3 hits nerf enemy bonus by 15 each, capping at -45. Each hit must connect to nerf. Lasts for 3 turns. 4th hit applies a 2X EP DoT effect for 3 turns. First 3 hits nerf enemy bonus by 10 each, capping at -30. Each hit must connect to nerf. Lasts for 3 turns. 4th hit applies a 1.5X EP DoT effect for 3 turns. Description: Hurls mecha-sized snowballs that freeze your for dealing EP DoT and lowering BtH! Images: Snow Slinger 8, Attacking! 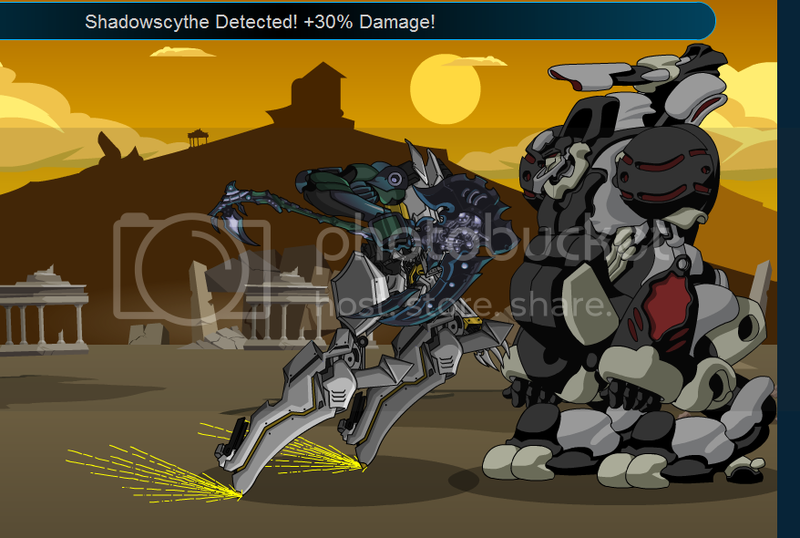 Description: Hurls mechs sized snowballs that freeze your for dealing EP DoT and lowering BtH! Images: Snow Slinger 16, Attacking! Images: Snow Slinger 24, Attacking! Images: Snow Slinger 32, Attacking! Images: Snow Slinger 39, Attacking! Images: Snow Slinger 45, Attacking! Images: Snow Slinger 50, Attacking! A quick update on the effects. Current entries are either incorrect or outdated. Yeti Leader FA (default): the boost nerf is -50 on first turn, then -40, then -30, then it wears off. Love HD series from the Love event: Crit is +45 and Bonus nerf is -40. Turkey Mace G series: disablement happens in FA/BA/FS order. Images: Snow Catapult -8C, Attacking! Images: Snow Catapult -14C, Attacking! Images: Snow Catapult -17C, Attacking! Images: Snow Catapult -21C, Attacking! Images: Snow Catapult -26C, Attacking! Images: Snow Catapult -34C, Attacking! Images: Snow Catapult -39C, Attacking! Images: Snow Catapult -45C, Attacking! Images: Snow Catapult -50C, Attacking! -50 immobility resistance, attempt to stun for 1 turn. 15% chance to stun for 2 turns. Images: Blizzard Bugle -8C, Attacking! Images: Blizzard Bugle -14C, Attacking! Images: Blizzard Bugle -17C, Attacking! Images: Blizzard Bugle -21C, Attacking! Images: Blizzard Bugle -26C, Attacking! Images: Blizzard Bugle -34C, Attacking! Images: Blizzard Bugle -39C, Attacking! Images: Blizzard Bugle -45C, Attacking! Images: Blizzard Bugle -50C, Attacking! 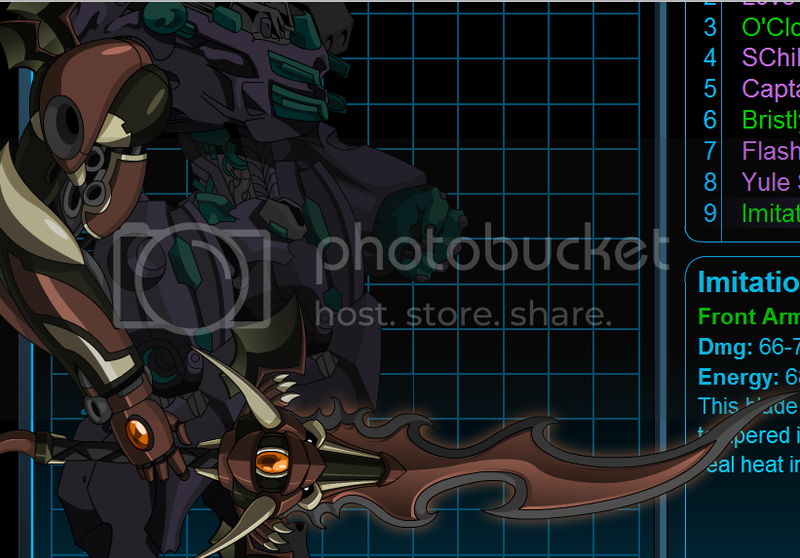 On a side note, the Winter Horn in the '08 items shop is a shoulder weapon, not an arm weapon, so it should be placed accordingly.